Proudly displayed on the bodies of Tahitians, you’ll find manta ray, shark, whale and sea turtle tattoos that tell the story of a people defined by the sea. Divers come from around the world to experience these sacred sea creatures, which, in The Islands of Tahiti, hold a place of reverence among the gods. It’s only natural that the sea around these islands is both figuratively and literally a clear blue heaven on earth. The warm waters that surround The Islands of Tahiti teem with life from flirty clown fish to ever-present sharks to awe-inspiring humpback whales, which arrive between July and November. When you’re ready to do some diving and snorkeling, the heavens await. The ocean represents the complete lifecycle to the Tahitians, and they have a masterful, reverential and respectful relationship with it. 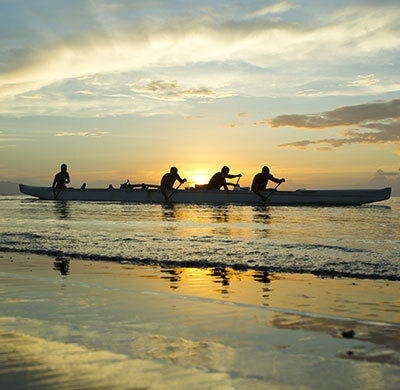 Traditional outrigger canoes, surfing and sailing are part of everyday life here in The Islands of Tahiti. Of course, travelers can also experience sunset cruising, kayaking, jet skiing and more. 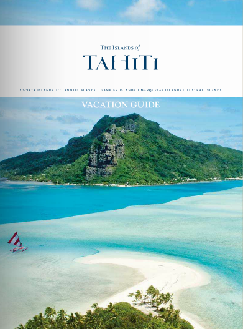 The sea, the rainforest and heaven are considered the realms of the gods in the Tahitian spiritual worlds, and we bet you’ll agree once you visit us. There are dozens of unique dive sites around each island and atoll and expert certified dive operators will take care of all the details. Dives and activities can be arranged in advance by your Preferred Travel Professional or through your resort or cruise ship. 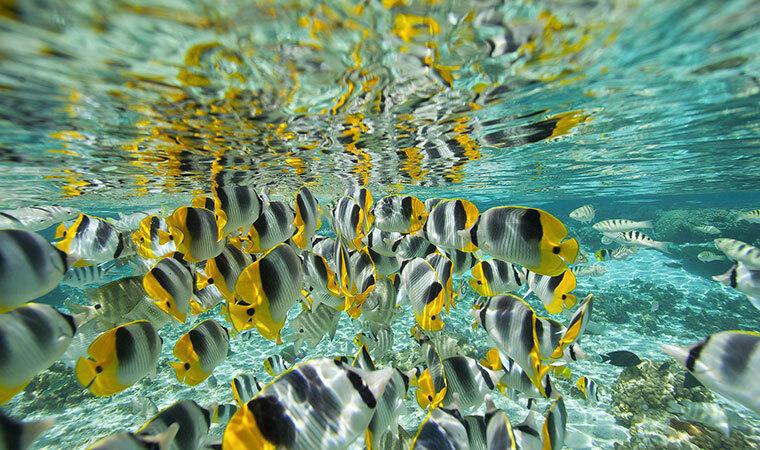 The crystal-clear waters of The Islands of Tahiti are home to more than 1,000 species of fish with an unmatched variety of color, size and shape. The smallest fish are often the most colorful and prefer the coral gardens and shallow depths of lagoons while larger species enjoy the bustle of life in the inlets and reef complexes and out in the open sea. The combination of canyons, caverns and coral beds provides a multitude of nooks and crannies for marine life. Because of its exceptional biodiversity, scientists consider the Polynesian sea zone to be the “richest aquarium on earth”. 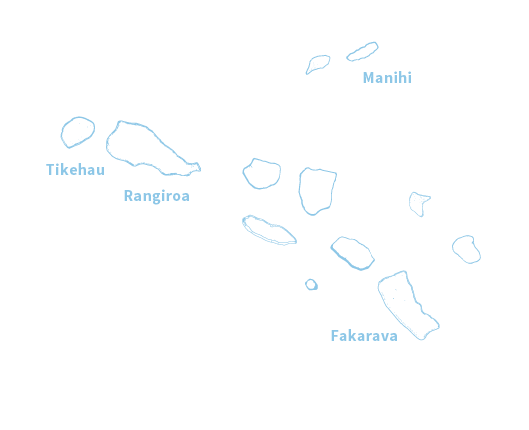 In 2000, the entire region was classified as an Exclusive Economic Zone (EEZ), a wildlife sanctuary where, among other things, drift fishing is prohibited, earning French Polynesia top honors from the WWF (World Wildlife Fund). The jade and turquoise waters of the lagoons of the Tuamotu and the Society Islands archipelagos, where slender, multi-colored fish species have evolved, attract nearly a third of all dolphin species from every ocean. Schools of damselfish, mullet and soldierfish frolic in the coral lacework as striped convict surgeonfish and frowning Picasso triggerfish pass by. Manta rays, gliding across the shimmering sea bottom, can suddenly leap skyward and re-enter the water right next to placid sharks basking in the lagoons. Sea turtles bury their eggs in the warm sands of deserted beaches as whales mate and calve in the undisturbed bays of our archipelagos: the Austral Islands, the Gambier Islands, the Tuamotu and the Society Islands. Every year, from July to November, humpback whales (megaptera novaeangliae) migrate from the icy waters of the Antarctic where they feed to the warm waters of the shores of The Islands Of Tahiti. It is the ideal place to give birth and breed, sheltered from their predators. The adults measure between 40 to 60 feet (15 to 18 meters). They look very graceful while moving their huge pectoral fins under the water. The calves measure about 15 feet (4.50 meters) at birth. They can put on up to 220 lbs. (100 kg) per day during the first week of life, whale’s milk contains the highest fat content of the animal kingdom. As a cetacean (whale) sanctuary since May 2002, all whales of French Polynesia are protected. Whale watching complies with strict local regulations. Where can I watch whales in The Islands of Tahiti? Although you can spot them from any island, Rurutu is a good location for whale watching. You should have an experienced guide who holds an official government authorization lead your whale watching expedition. How can I watch whales in The Islands of Tahiti? Bubbles are a sign of aggressiveness to marine mammals. Scuba diving is, therefore, not the best way to approach them. 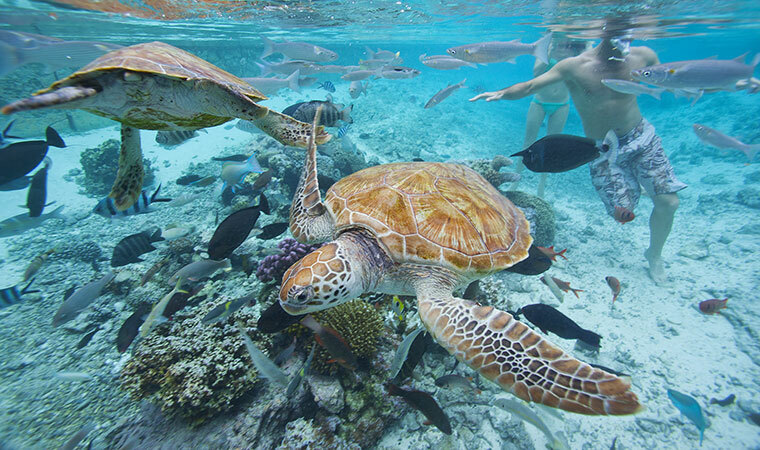 You are likely to experience a once in a lifetime encounter with only your snorkeling gear. For you and the whales’ safety always follow your guide’s instructions when you are in their presence. As a cetacean sanctuary, the dozen dolphin species of French Polynesia are also protected. They are present year round and can be seen around any of the islands. Dolphins behave very similarly to humans. They give birth, nurse their calves and breathe air. Their communication skills are very sophisticated. You’re highly likely to encounter some of them during your stay in The Islands of Tahiti. Three main species are easily watched depending on the areas: bottle nosed dolphins (tursiops truncatus), spinner dolphins (stenella longirostris) and rough toothed dolphins (steno bredanensis). Out of the 350 species known worldwide, 19 of them can be observed in the waters of French Polynesia, which is a perfect place for any diver to encounter them. It is also the ideal place to remove some of the myths surrounding sharks. 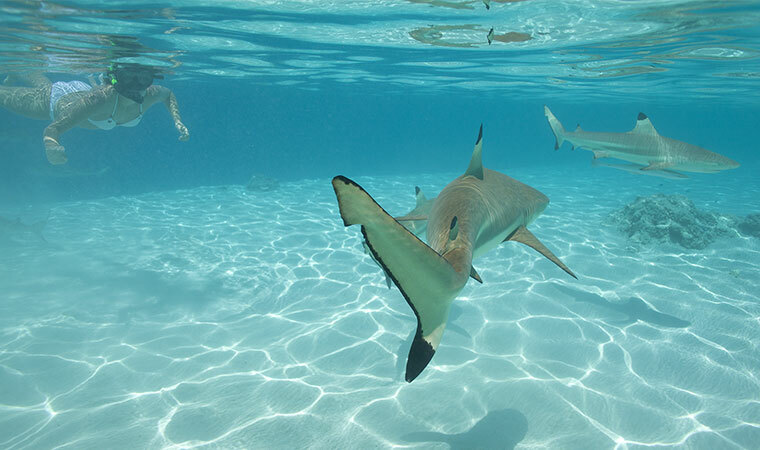 The most commonly encountered species in The Islands of Tahiti are the famous black tip sharks (carcharhinus melanopterus – Tahitian name: ma’o mauri), grey sharks (carcharhinus amblyrhynchos – Tahitian name: raira), lemon sharks (negaprion acutidens, Tahitian name: arava) and hammerhead sharks (sphyrna lewini or sphyrna mokarran – Tahitian name: ma’o tuamata). From antiquity to today, the western world has viewed sharks as bloodthirsty animals. Yet, the ancient ma’ohi lived with them in harmony. Sharks represented a protective icon in which the kind spirit of a family ancestor was reincarnated. Sharks belong at the top of the food chain and are generally either predators (population controllers) or scavengers and cleaners. They play an essential role in regulation and balance of the marine eco-systems. Thought to have evolved about 400 million years ago, these fish are extremely well developed and perfectly adapted to their environment. Having had no predator for millions of years, the rate of breeding is slow and quite inefficient. Depending on the species, a female’s gestation can take four to 24 months with a potential fertilization only taking place every couple of years. Overfishing, pollution and killing sharks for their fins represent some of the many threats factors threatening and endangering sharks. According to scientific data, it’s estimated that more than 150 million sharks are killed each year. Some species are already nearly extinct. To mitigate this problem, French Polynesia government made the decision to protect them by law in 2006. 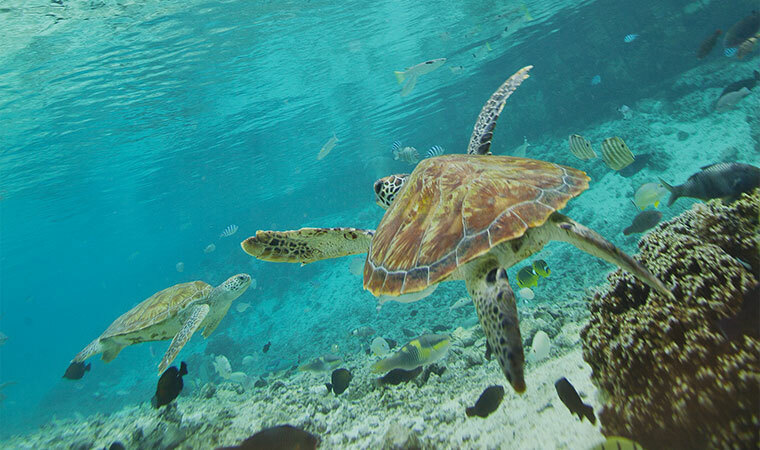 Two main turtle species live in French Polynesia and are easily encountered in some dive spots. The green turtle (chelonia mydas) owes its name to the color of its flesh and fat. The female reaches sexual maturity between 15 and 20 years of age. She can measure 60 inches (1.50 meters) and weigh up to 441 lbs. (200 kg). The juveniles are carnivorous, but become herbivorous once they are adults. The hawksbill turtle (eretmochelys imbricata) is smaller and does not measure more than 35 inches (90 cm) for a weight of 198 lbs. (90kg). Carnivorous, they are often found searching for small sponges stuck under rocks. They move using these rocks using their frontal legs. Oviparian, they have a slow reproduction cycle and a late sexual maturity. There are less and less laying sites due to loss of habitat from human development and they are the victims of drift net fishing and hunting. Turtles are now in danger of extinction worldwide. Numerous consciousness-raising campaigns are promoted in The Islands of Tahiti to ensure their conservation. Belonging to the elasmobranch family, rays are close cousins to the sharks. They appeared about 150 million years ago. Like the sharks, they have a cartilaginous skeleton. Yet, they are quite different: their branchial slits are located on the belly and their oversized pectoral fins are welded to their head enabling propulsion. This is what makes them look so gracious, appearing almost like underwater birds. Like their cousins, they have two sexual appendices called pterygopods. 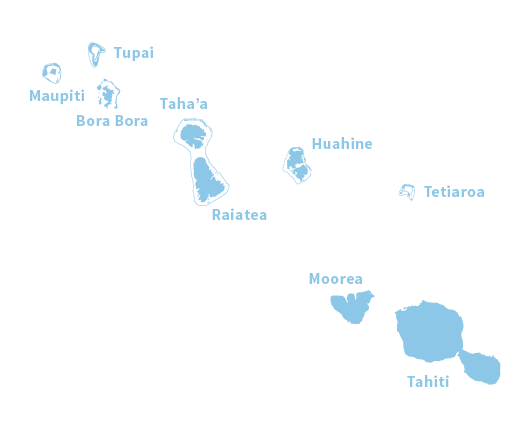 Three species of rays can be found easily in The Islands of Tahiti: sting rays (himantura fai – Tahitian name: fai i’u), eagle rays (aétobaus narinar – Tahitian name: faimanu) and manta rays (manta birostris – Tahitian name : fafapiti). A couple of other manta species may also be seen: himantura sp. 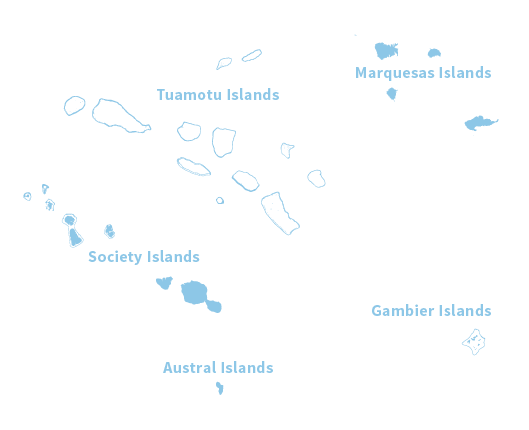 In the Marquesas and mobula tarapacana, a pelagic kind of manta ray bound to be encountered in the Tuamotu, Gambier and Marquesas. 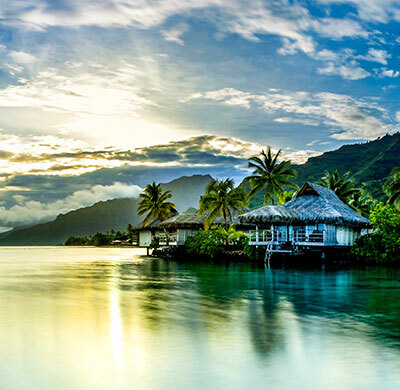 Around all The Islands of Tahiti, dramatic views continue below the water. Divers and snorkelers are amazed by the density of large marine life. Regular encounters include manta rays whose gigantic wingspan eclipses the passing diver; schools of dolphin dancing along the surf; sharks seemingly at every turn; and, in the Austral Islands, humpback whales thrill the lucky spectators in their annual parade. Whether you are a professional photographer or an amateur, French Polynesia is a perfect place for your passion. Indeed, the underwater clarity and visibility are excellent. A wide-angle lens is ideal for capturing your amazing encounters with the sharks and other pelagic fish. Those who enjoy macro photography will also be thrilled. The Islands of Tahiti are famous worldwide for the opportunities to capture amazing images of humpback whales either through video or photography. To protect yourself from paying duty taxes arriving and returning home you should carry copies of your camera’s (and their accessories) purchase receipts in order to avoid any inconvenience with customs. Many dive centers work with an underwater cameraman. He will join your group during the dives and create a customized DVD to commemorate your dive in The Islands of Tahiti. The Islands of Tahiti have an abundance of specialized equipment and professionals to assist you in organizing shooting underwater images or TV documentaries. Some local producers have a wide range of experience in their field and an excellent set of references. Most bring with them a technically competent team, who will also be able to provide you with HD video cameras with underwater housing. Each island is a nature’s underwater studio. In Tahiti, Moorea and Bora Bora, glass-bottom boats and ‘aquascopes’ (a panoramic room situated under the bridge of the boat) make it possible to discover things hidden under the surface of the lagoon while staying dry. It’s a totally original adventure that provides great opportunities to photograph aquatic landscapes. Small underwater vehicles are the ideal means of transport to go down 150 feet (50 meters) deep, and observe in detail the underwater depths without getting wet. Diving with a helmet gives you the opportunity to take an aquatic excursion to a depth of 12 feet (3-4 meters). This activity does not require any level of diving skills or knowledge of classic diving equipment because your helmet is constantly connected to the surface. Accompanied by a qualified instructor, those who journey downwards explore the depths of the sea at their own pace, walking through the fields of coral. Fun and very accessible, the underwater scooter requires no diving experience. Just like their land-based versions, underwater scooters are propelled by electric motors, to a depth of 9 feet (3 meters), and can seat two passengers who can talk using a communal dome. This activity is available in Bora Bora.